Summary: Difference Between Cementum and Periodontal Ligament is that Cementum is comparable to bone in its proportion of inorganic to organic constituents and to similarities in its structure. 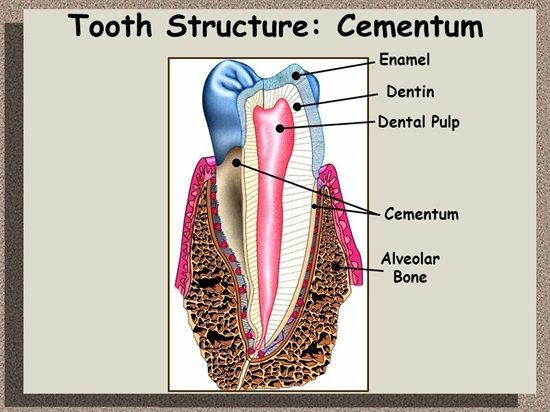 The cementum is thinnest at its junction with the enamel and thickest at the apex. While periodontal ligament is a fibrous connective tissue, which anchors the tooth to the alveolar bone. The collagen fibers of the periodontal ligament penetrate the alveolar bone and cementum. They have a wavy course. The periodontal ligament is a fibrous connective tissue, which anchors the tooth to the alveolar bone. The collagen fibers of the periodontal ligament penetrate the alveolar bone and cementum. They have a wavy course. The periodontal ligament has the formative cells of bone and cementum, i.e. osteoblast and cementoblast in addition to fibroblast and resorptive cells—the osteoclast. Cementoclasts are very rarely seen as cemental resorption is not seen in health. Fibroblast, also functions as a resorptive cell. Thus, with the presence of both formative and resorptive cells of bone, cementum and connective tissue, and along with the wavy nature of the fibers, the periodontal ligament is able to adjust itself to the constant change in the position of teeth, and also maintains its width. The periodontal fibers connect all the teeth in the arch to keep them together and also attach the gingiva to the tooth. The periodontal ligament nourishes the cementum. The presence of proprioceptive nerve endings provides the tactile sensation to the tooth and excessive pressure on the tooth is prevented by pain originating from the pain receptors in the periodontal ligament.